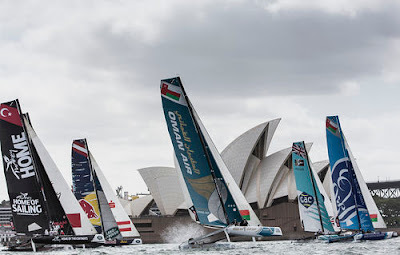 After two physical, full-on days of racing on Sydney Harbour, the penultimate day was all about the points at the Extreme Sailing Series Act 8, Sydney presented by Land Rover – the final stop on the 2015 global tour. With their end game in sight, The Wave, Muscat and British helm Leigh McMillan sailed today in defensive-attack. Careful not to engage with his competitors on the racetrack, time and time again the crowds watched as McMillan tactically crossed the start line, split from the pack and created his own opportunities to sail through the fleet, to take six podium positions from eight races. The Wave, Muscat’s relentless but reserved tactics puts the team at the top of the leaderboard going into the final day on 147-points – and a step closer for McMillan to make history as the only ever skipper to win three Extreme Sailing Series championship titles. But while McMillan played it safe, the battle heated up for second and third, in both Sydney and on the overall Series leaderboard, as Danes, SAP Extreme Sailing Team and Austrians, Red Bull Sailing Team both gunned for glory. Adding four podiums to their scoreline, the Danes finished the day in second place with just a four-point gap to bridge to the top spot. However, the performance of the day goes Red Bull Sailing Team, the fastest team on the water and quickest off the start line according to SAP Analytics. Skipper double Olympic gold medallist Roman Hagara sailed a smart day, and race after race cashed in, adding 60-points to their score line and finishing the day in third. “The goal is to win this Act, it’s so important to finish on a high. It would be perfect to stand on the podium in the number one spot. We just have to get everything together tomorrow and make sure our starts are spot on,” said Hagara after racing. Oman Air drop down to fourth but with only five points separating them from third, it wouldn’t take much for underdog skipper Stevie Morrison to get back on the podium in tomorrow’s final. Crowd pleasers Team Turx took two race wins to finish the day in fifth with Lino Sonego Team Italia bouncing back from their capsize yesterday, climbing the rankings to sixth place. 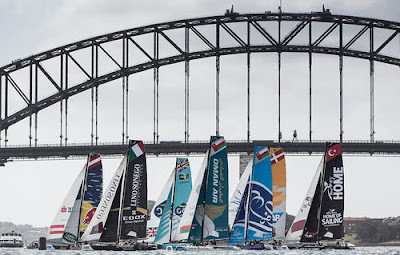 Gazprom Team Russia and GAC Pindar round up the overnight standings in seventh and eighth, with Australian wild card entry 33 South Racing in ninth after missing a day due to a crash on the first day. “We want more days to race! We can see the improvements and we are really excited for tomorrow – we are after our first podium. We love the home crowd. 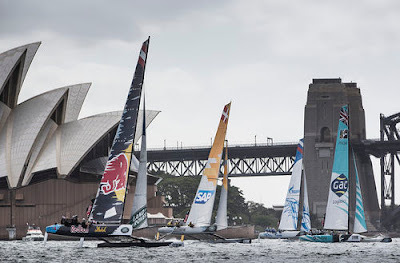 It is so cool to hear them cheering as on,”commented Aussie skipper Katie Spithill. 1. The Wave, Muscat (OMA) Leigh McMillan, Sarah Ayton, Pete Greenhalgh, Ed Smyth, Nasser Al Mashari 147 points. 2. SAP Extreme Sailing Team (DEN) Jes Gram-Hansen, Rasmus Køstner, Thierry Douillard, Mads Emil Stephensen, Brad Farrand 144 points. 3. Red Bull Sailing Team (AUT) Roman Hagara, Hans-Peter Steinacher, Lionel Vaucher, Shaun Mason, Stewart Dodson 131 points. 4. Oman Air (OMA) Stevie Morrison, Nic Asher, Ted Hackney, Ed Powys, Ali Al Balashi 126 points. 5. Team Turx (TUR) Mitch Booth, Edhem Dirvana, Selim Kakis, Diogo Cayolla, Pedro Andrade 123 points. 6. Lino Sonego Team Italia (ITA) Enrico Zennaro, Pierre Pennec, Nevio Sabadin, Stefano Rizzi,Tom Buggy 87 points. 7. Gazprom Team Russia (RUS) Igor Lisovenko, Pavel Kalinichev, Pavel Karachi, Alexander Bozhko, Aleksey Kulakov 87 points. 8. GAC Pindar (GBR) Adam Minoprio, Seve Jarvin, Jeremy Lomas, James Wierzbowski, Tyson Lamond 75 points. 9. 33 South Racing (AUS) Katie Spithill, Matthew Chew, Stacey Jackson, Henry Kernot, Luke Payne 71 points.